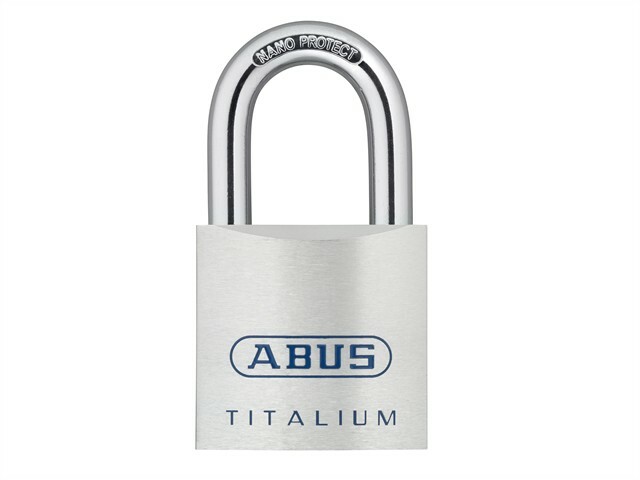 The ABUS 80TI Series TITALIUM™ Padlocks are the flagship of the TITALIUM™ family of padlocks. They make an impression with both their looks and technical properties. They have a solid lock body made from TITALIUM™ aluminium alloy, a mixture of materials is created that is extremely durable and lightweight. It has a 6-pin precision cylinder with paracentric keyway giving protection against both forced or manipulative break-ins. A chrome plated cylinder core and double bolted hardened steel shackle with NANO PROTECT™ shackle coating assures security and high corrosion resistance. Suitable for securing goods/valuables of higher value or at a high risk of theft. Ideal for doors, gates, cupboards, lockers, tool boxes, etc.